Whether you’re thinking of buying and setting up a fish and chip shop, need to get your existing business back on track, or want to develop a promising apprentice, team leader or manager – this three-day intensive fish and chip training course is a must! Keeping accounts, Planning your working day in a business, Filtering machine demonstration, Practical session - including fish, chip, batter preparation & frying, Meal break (this involves eating the food prepared and fried by you), Packaging and portion control, Summary and review, Food safety exam and/or health and safety exam. Everyone has been amazing and differing opinions have been wonderful. Special mention to David Miller for teaching me how to cut fish – I was really struggling before his lesson. This was a one of a kind course. It took me through all aspects of owning and running a fish and chip shop. Exceptional trainers. If I employ staff in time, when I am in a position to do so I will send them on the course. Thank you to the whole team for an amazing and inspiring 3 days! Fantastic course, very professional and easy to understand. Every member of staff was amazing. Just really pleased! Thanks to all at NFFF. All trainers were brilliant, very informative and answered lots of questions. 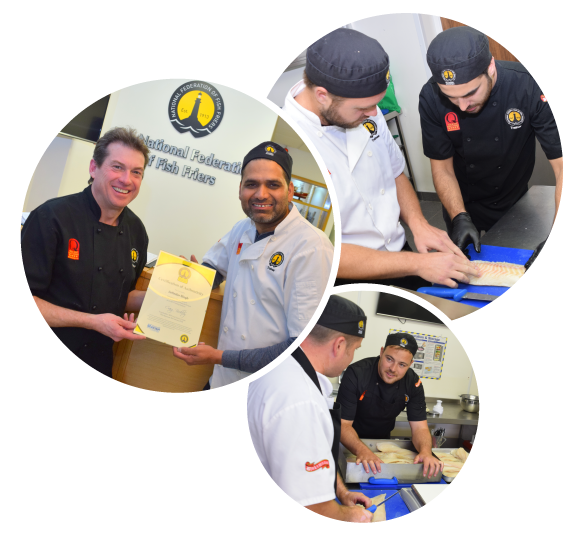 Great to receive training from current fish and chip shop owners. Learnt so much. Very, very, very good 11 out of 10. Great course – learnt heaps of info and feel confident moving forward. Thoroughly enjoyed all the course. Exceeded my expectations. All trainers very passionate and knowledgeable in their field. Good to have a mix of trainers, skills and experience.